I started to think of old connotations of the space and how it was previously an old club; and instantly thought about the mass of people that have previously passed though the space and began to wonder what bodily fluids has touched its surface, i.e. urine, syliva. My work has previously referenced or suggested the body, using materials that have bodily qualities that somehow reference a contained decay of some sort. This work where I am walking whilst urinating onto canvas is questioning whether the body is requires a presence or absence, the action or trace or both? 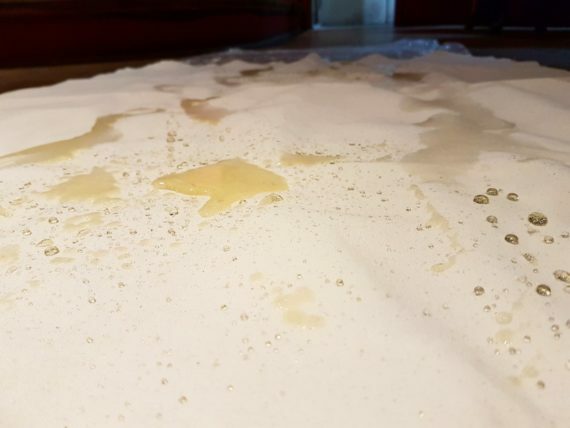 Over the next few weeks I will continuously urinate on canvas where I am placing myself in a vulnerable situation creating layer upon layer of my bodily fluid. My body has never been used as a material in my previous work however I’m interested in using my body as a reference point; thinking about the intentions and the limits of my body as a material. The first urination over the canvas I found it incredibly strange and unconventional, wearing a black dress I walked slowly across the length of the canvas urinating in a very controlled and slow manner. 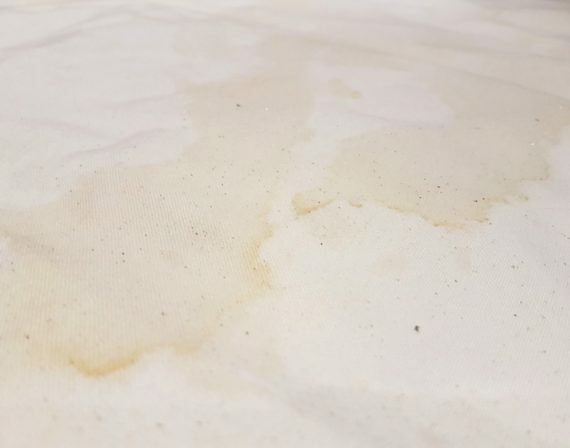 The urine was warm, and running down the inside of my legs; the sound of the urine hitting and forming puddles on the surface of the canvas was unnerving. After discussing the work with Josh and James, what was interesting is how gender was the forefront of discussion; when using the body you can’t avoid gender politics. What came up in our conversation was how this work forms the basis of taking back control of my body, and my choice to blur those boundaries and urinate in a public setting as a female conflicting that orthodox male behaviour. It’s interesting how I am walking along the canvas, boldly urinating with no shame but this is currently taking place in the space when it is only me present; therefore I question how the work will be read and perceived by an audience present. What I need to consider and develop is how I set up the work; where in relation to the space does the canvas take its place. This is where I question whether the work is a focus on the action or the trace of the artist? Will the work result in both? It’s a question as to whether I will document the action and therefore the traces of the action will be visible or whether I perform the action? Both images reference the action and trace but I’m interested in documenting the action over a period of a month, creating visible traces, line, and action of my bodily fluid. There’s an interesting contrast of yellow, brown stains sitting and seeping slowly, the urine absorbing into the fibres of the canvas where visible footprint marks suggest my movement. This work remains on-going yet unresolved; therefore there will be a continuation of questioning my presence as the artist and material.